Imagine enjoying a late summer sunset while cruising Lake Ouachita, just north of Hot Springs. In the distance, you notice what looks like a small cloud of mosquitoes. As it gets closer, the cloud gets larger, and you realize it’s not mosquitoes at all, but a huge swarm of birds! They are purple martins, coming to roost on Bird Island for the night. and August, 30,000 to 50,000 purple martins can be seen roosting each evening before migrating to South America. This island of bald cypress is only about 1200 feet long and 100 feet wide, but is the largest purple martin roost in Arkansas. The martins also share their nightly resting spot with blue heron, white ibis, and red-winged blackbirds. To truly appreciate this spectacle, you absolutely must see it for yourself! 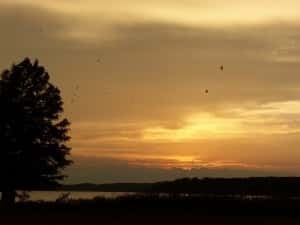 Lake Ouachita State Park gives tours of Bird Island on various evenings (and a few early mornings) only in July and August. Tours leave from the marina at 7:30 pm. A state park interpreter will guide your cruise out to Bird Island as the sun sets and will circle several times as the birds fly in to roost. Tickets for the tour are $10 for adults, and can be purchased at the visitors center, just across from the marina. If you want to learn even more, plan to attend Purple Martin Awareness Weekend at the park August 1-2, 2015. Along with the lake tours, there will also be programs to identify and help protect these beloved birds. We are just 31 miles from Lake Ouachita State Park. You can view hummingbirds, tufted titmice, indigo buntings, whippoorwills and many other birds from our fabulous front porch, or the privacy of your own deck when you stay in The Hamilton.